I thought that I would enlighten folks that the UN has been in your back yard for some years without most of you realizing it. ICLEI is a subsidiary of the UN whose goal is to push for "sustainability" AKA also known as Agenda 21/2030...AKA one world order. This is not fake or controversial. Their presence varies from state to state and region to region, but the list below from 3 years ago shows that they are across the U.S. This list in the link is the only U.S. partner list that I have been able to find since ICLEI pulled the list off of their own website a few years ago. If you are curious you can research how ICLEI influences local governments and California infested with them. SOCOM42 and 7052 like this. My city is on that list. I'm a little confused. Who are they and what do they do or push for? SDF880 and RedLion like this. A people without land are dependent on the state for all and not as likely to create problems. Mucho appreciato on the crash coarse. I do know about Agenda 21 but had never heard of ICLEI or knew what it stood for. Seems to me they are acting much like a lobbyist and trying to influence policy. Not much we can do about that except vote out politicians that give them an ear. Most people are too busy trying to keep up with the Kardashians let alone have a grasp of what's really going on in politics. RedLion, Coastie dad and SDF880 like this. True to a good degree, but why the intentionally cloak and dagger? Most Americans still do not want govt to control most of their lives. Restrictions also unnecessarily impede businesses. More info on the Wildlands project. The Wildlands Project would set up to one-half of America into core wilderness reserves and interconnecting corridors (red), all surrounded by interconnecting buffer zones (yellow). No human activity would be permitted in the red, and only highly regulated activity would be permitted in the yellow areas. Four concerned conservative activists who now make up the board of Sovereignty International were able to find UN documentation that proved the Wildlands Project concept was to provide the basis for the UN Convention on Biological Diversity. They used this information and this map produced by Dr. Michael Coffman, editor of Discerning the Times Digest and NewsBytes and CEO of Sovereignty International, to stop the ratification of the treaty an hour before its scheduled cloture and ratification vote. (See Congressional Record S13790) Since the treaty was stopped, tens of thousands of Americans have used this map to expose environmentalist's efforts to implement this diabolical agenda piecemeal local, just as President Clinton is doing by setting aside millions of acres of public and private land. © 2000 Discerning the Times Digest and NewsBytes. This planning for where to relocate humans in order to create the cores, corridors, and buffer zones began in the United States several decades ago. We know this because in 1994 the U.S. Senate was scheduled to ratify the Biodiversity Treaty. 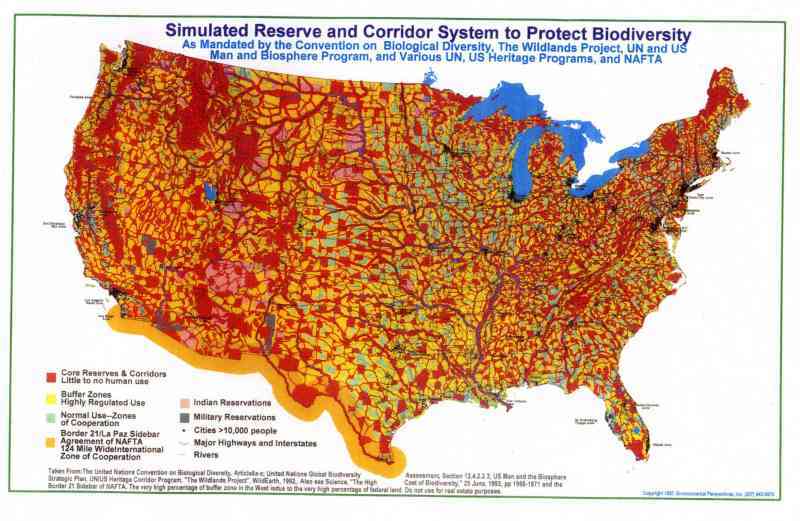 During that year, Dr. Michael Coffman pounded the capital with e-mails and calls, and before ratifying the Biodiversity Treaty Dr. Coffman presented a copy of the Biodiversity map to his Senator, who showed it to the Senate. The Senate Majority leader took the treaty off of the calendar and it was never ratified. Who says one person cannot make a difference!! let them try to do some thing here , I am " LOCKED & LOADED " for anyone . RedLion, MaterielGeneral and stevekozak like this. Getting guns out of our hands is part of the UN Small Arms Treaty. Nice to know what direction their coming from. Anyone tried the "Backyard Liberty" aquaponics system?